The Consumer Price Index (CPI) moved up 0.2% in October, after a 0.1% gain in the prior month. The year-to-year change is 1.2%, with the CPI trending down after a 2.7% increase in December. During the July-October period, energy prices have lifted the overall CPI. In October, higher gasoline prices (+4.6%) were responsible for nearly 90% of the increase in the CPI. 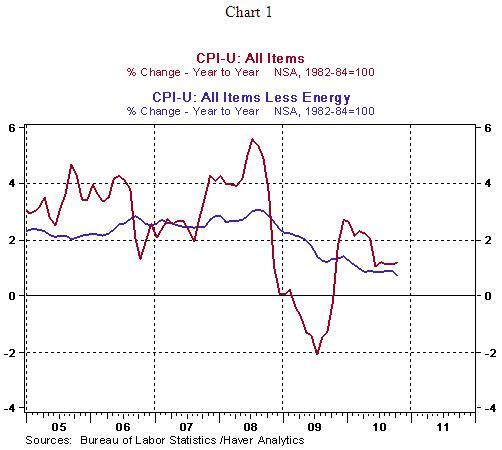 The CPI excluding energy held steady in October after a similar reading in the prior month. Food prices inched up 0.1% in October, putting the year-to-year gain at 1.4%. The core CPI, which excludes food and energy, held steady for the third month in a row. 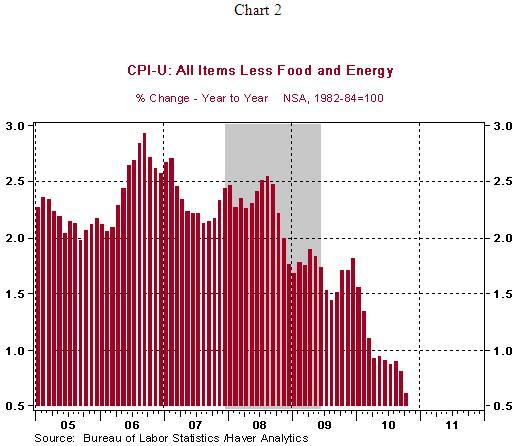 The 0.6% year-to-year increase in the CPI is the lowest since record keeping began for this series in 1957. The core CPI makes up nearly 78% of CPI. The underlying pace of inflation remains more contained than what the Fed would prefer. In October, price measures of shelter (+0.1%) and medical care (+0.2%) advanced but these higher prices were offset by declines in prices of new cars and trucks, clothing, tobacco and recreation. The probability of deflation is significant, given the decelerating trend of both overall and core consumer prices, if the economic fails to grow at a more rapid clip compared with the tepid pace of the sub-par growth seen in the second and third quarter of 2010. The October CPI report supports recent plans of the Fed to engage in $600 billion of purchases of Treasury securities.